This breaking news story is developing. 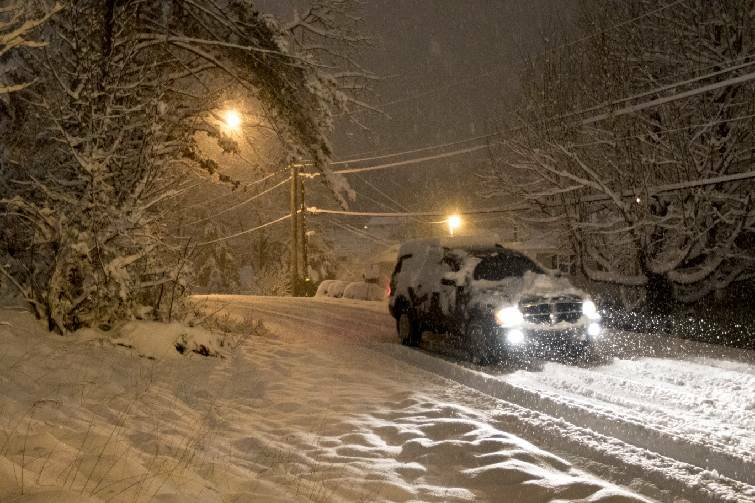 A vehicle travels on Winding Way after heavy regional snowfall blanketed the area Wednesday, Feb. 25, 2015, in Chattanooga, Tenn.
Tennessee Emergency Management Agency officials have declared a state of emergency ahead of a major winter weather system that is moving into the state. Officials say that freezing rain, sleet, snow and high winds could create blizzard-like conditions in some areas, which in the past has led to stranded motorists, power outages and people in need of shelter. Officials at the state's emergency operations center in Nashville will monitor the storm and its effects, and have made contact with the American Red Cross and other agencies. The east part of the state will see freezing rain, with snowfall moving into the area on Friday evening. On Friday night, the north part of the state will see snowfall, while the Chattanooga area is likely to see rain. Temperatures as high as 42 and as low as 18 are expected into the weekend. In the Chattanooga area, snow accumulations of 1 inch to 3 inches are possible, with more coming down in the mountains. UTC is closing at 3 p.m. today and all day Saturday. All events closed. All Hamilton County athletic events have been postponed. All Tennessee emissions testing stations are closed. Fannin County Public Health Department is closed. Gilmer County Public Health Department is closed. Whitfield County Schools will close early today because of the weather forecast. Elementary schools will close at 1 p.m. and middle and high school will close at 2 p.m.
All school-related activities scheduled for Saturday, Jan. 23, are canceled for Whitfield County Schools. Due to severe weather, all Tennessee state offices will be closed today. Chickamauga City Schools will have regular school hours today. All extracurricular activities this evening and Saturday are cancelled. Aftercare will close at 4 p.m. The Dalton-Whitfield Solid Waste Authority has announced that it's four facilities in Whitfield County will close early at 3 p.m. today due to inclement weather. Locations include the Old Dixie Landfill & Convenience Center, McGaughey Chapel Convenience Center in Cohutta, Westside Convenience Center in Rocky Face, and the M.L. King Blvd. Convenience Center in Dalton. The North Georgia Health District office in Dalton and Public Health Departments in Cherokee, Murray, Pickens and Whitfield Counties will close today at noon - this includes all WIC and Children's Health Services. Dayton City Schools will open two hours late. Hamilton County Schools will dismiss 1 hour and 45 minutes early beginning with the early start schools at 12:30 p.m. School Age Child Care will be closed this afternoon. Georgia Northwestern Technical College will close at noon. Bradley County Schools will dismiss today at 1:45 p.m.
Be sure you have adequate clothing and blankets to keep you warm. Have sufficient heating fuel for your home. Store a good supply of dry, seasoned wood for your fireplace or wood-burning stove. Bring pets and companion animals inside during winter weather. Move other animals or livestock to sheltered areas with non-frozen drinking water. If pipes freeze, remove any insulation or layers of newspapers and wrap pipes in rags. Completely open all faucets and pour hot water over the pipes, starting where they were most exposed to the cold (or where the cold was most likely to penetrate). If you go outside, watch for signs of frostbite (loss of feeling and white or pale appearance in extremities) and hypothermia (uncontrollable shivering, memory loss, disorientation, incoherence, slurred speech, drowsiness, and apparent exhaustion). Seek warm shelter and medical treatment immediately for frostbite and hypothermia symptoms. Have a winter safety kit in your car with water, food, first aid supplies, blankets, gloves, heavy boots, food, flashlight, extra batteries, and warning lights or flares. Call *THP (*847) if you get stranded to be connected to the closest Tennessee Highway Patrol dispatch location. Call 511 for traffic information from the Tennessee Department of Transportation. Monitor local radio and television broadcasts, and NOAA Weather Radio, for updates on weather forecasts and conditions. Listen to NOAA Weather Radio for winter weather watches and warnings. Monitor local radio and television stations for updates on weather and road conditions. Download the ReadyTN smartphone app to get weather, road conditions and emergency preparedness information on your smartphone. Stay with the Times Free Press for cold weather tips, forecasts, school closings and more.